I have voted in every presidential election since 1956. I was disillusioned after the highly suspect voting accuracy count in the years 2000 and 2004 and the Supreme Court deciding the result in 2000. Now we have one superdelegate's vote counting for 13,000 votes. What am I, chopped liver? Welcome to the Third World America. Until we go with the popular vote whereby my one vote is the equivalent of anyone else's, I'm hanging up my marker. People waited in a line that snaked around the cafeteria and through the campus during the Democratic caucus last Tuesday at Kawananakoa Elementary School in Nuuanu. 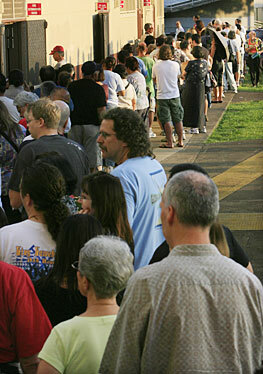 Thousands of Democratic Party members came to vote, overwhelming staff and causing many delays. According to news reports, Sen. Daniel Inouye, who plans to vote for Sen. Hillary Clinton as a superdelegate, stated that "it makes no difference what the outcome (of the election) is, but the fact that the turnout was so extraordinary shows that democracy works." Honorable Senator, have you got it all wrong. When more than 75 percent of voters wait for hours (in my case almost two hours) to vote for Sen. Barack Obama and when all 51 state districts give a comprehensive victory to Obama with a record turnout, you better believe that the old smoke-filled-room days are over and it does make a difference. The vote on Tuesday was a solid mandate from the people of Hawaii and voting for anyone except Obama is unconscionable. Richard Port, a Democratic national committeeman and one of Hawaii's superdelegates, said, "My support for Hillary Clinton is probably going to cost me my re-election but I feel it's a matter of principle." Mr. Port, you are so right. I hope the Democratic Party and all our superdelegates get the message. The people have spoken and we won't forget. It will cost their re-election. I can almost guarantee it! Senator Inouye, that's how democracy REALLY works. I was stationed at Pearl Harbor during the last year of World War II, I saw first hand the suffering and ravages of that conflict. Now, at age 89, I am urging older people in particular to consider who has the best chance of leaving a better, more peaceful world for our grandchildren. Facing the challenges ahead will require a president who can unite and inspire our country. That person is Barack Obama. Can we afford Obama's wealth redistribution? I am amazed that voters feel someone is qualified for the office of president just because he happens to have been born in Hawaii and went to Punahou. What is even more amazing is the buy-in to the rhetoric from Barack Obama with a banner of change. What change? What kind of change? What specifically would be done? I am surprised that people would be taken in by a wealth redistribution system based on what can only be assessed as a socialist agenda. How much is the voter willing to pay? Will they pay 25 percent of income, or 28 percent or even 30 percent of their income? Are folks willing to have their personal retirement investments raided by proposed capital gains and dividend taxes? The notion that the wealthy will pay for more than $800 billion in new domestic entitlements is ludicrous. There isn't that much money in taxes from that base, but there is in the middle class. The wealthy will move their money overseas and the touted change will cause a disinterest in investing in America. The poor have no money so that leaves us; the middle class; the folks Obama says he wants to make changes for. I see an economic nightmare on the horizon. As a woman it is exciting to see people supporting Hillary Clinton. Sen. Daniel Inouye's endorsement and pledge, as a superdelegate, to vote for Clinton gives me hope that someday a woman could be president. I am concerned, however, that it's looking like the nomination will rest on the votes of superdelegates, such as Inouye, rather than on the votes of the people who are turning out in record numbers -- mostly in support of Sen. Barack Obama. It would be a shame for party insiders to divide the party and to throw away all the enthusiasm generated by this historic election. The people already had an election stolen from them in 2000. Do we want to steal an election from our own supporters? If superdelegates play crony politics, leaving us with a candidate who did not win popular support, you can bet that voter turnout will be low come November and many Democrats will find themselves unemployed after the midterm elections. Split the party and risk losing the White House and Congress or listen to the will of the people? The choice seems obvious. My Jan. 29 electric bill is a whopping $81.13, last month around $68, before being rather steady in the low $50s. I am a single person in a small condo, gone from 5 a.m. until 7 p.m. I have bought efficiency light bulbs, also power strips to prevent leakage when not in use. I am not using air conditioning or fans much. On calling Hawaiian Electric customer service, I asked what the average bill for others like me was and was told that we can't compare ourselves with others users, it is dependent on "lifestyle." She cited oil prices and repeatedly noted that I am using a refrigerator (I should admit taking a shower daily, too). I learned that $7 is charged every household for reading meters, and that my "non-fuel energy" is $24.98 (?). After probing, she said my energy cost adjustment in January 2007 was $14.22. It is now $32.09. Isn't this a more than 100 percent increase? She said this is the price to live in paradise. And Friday's Star-Bulletin says, "Hawaiian Electric profit jumps 152 percent." Regarding your Feb. 22 article about Hawaiian Electric's earnings, while we appreciate the favorable coverage focusing on the fourth quarter 2007 increase compared to fourth quarter 2006, we do feel a responsibility to correct a misimpression that might result from the story. The fact is that overall earnings were down 22 percent in 2007 compared to the year before. We are working hard to improve results because a strong company is good for customers and for investors, including the more than 20,000 Hawaii residents who are shareholders. The fourth quarter results are a good start, but from an overall standpoint, 2007 financial performance was significantly down. We acknowledge that and would not want readers to be misled by the article. The Star-Bulletin's Feb. 19 report "Pension agency splits assets" is another example of Bush administration dishonesty. It deals with the decision of the government's Pension Benefit Guaranty Corp. to put more of its $55 billion fund into the stock market. Already holding a deficit of $14 billion, the fund will lower safe fixed-income for pensioners from 72 percent to 50 percent, increasing their risk from 28 percent to 50 percent. Forty-four million retirees will lose more and shareholders will have more gains. Retirement is not a time for risk-taking and especially during an era of rising financial insecurity. What could be more blatant benefit for unearned income gainers and obvious theft from pensioners?